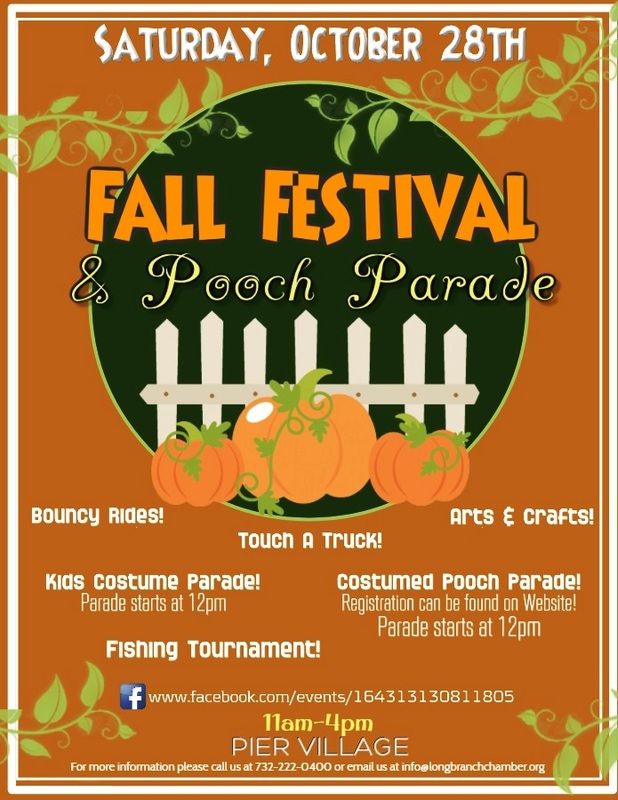 Join the Chamber of Commerce for family fun at the Long Branch Fall Festival & Pooch Parade! The Fall Festival will feature arts & crafts, touch a truck, bouncy rides, a costumed pooch parade, a kids costume parade, and craft vendors! There will also be a DJ present the entire day as well as costume characters! The shops of Pier Village and our Chamber of Commerce trailer will be participating in trick-or-treating so come prepared to bring home candy! Fishing will take place from October 21st to October 28th with awards given out at 3:45pm on the 28th. Fishing can take place from Sandy Hook to Allenhurst and will only include Striped Bass and Bluefish. The application lists tournament rules and regulations. Interested in participating as a vendor? Click here to download our application! Want to register your dog for the pooch parade? Don’t worry, there’s an application for that too! Click here! Oh, you want to participate in the fishing tournament? We have an application for that too! Click here! Payment for Fishing Tournament & Pooch Parade can be submitted online or a check can be mailed to The Greater Long Branch Chamber of Commerce, P.O Box 628, Long Branch, NJ 07740. 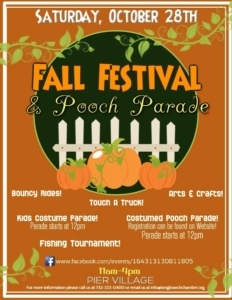 We will also accept payment for the Pooch Parade the morning of the event. In the meantime, RSVP to our Facebook event to keep updated!